How to drive everyday life toward creativity and a positive state of mind? Can interaction design trigger emotions and reinforce well-being attitude? This paper is a first exploratory study of design research, trends and practices on how devices and interfaces could advance when engaging more deeply with the recognition of emotions. The purpose is to provide insights and resources across different perspectives for the understanding of the emerging landscape of emotion-based technologies and on how it can evolve with future interfaces involving well-being intent. The role of emotions in the design has been growing, this paper gathers the preliminary approaches to frame drivers that influence the design, especially dealing with new directions and visions to address wellbeing. Emotions are naturally interactive (reactions) overwhelming the human body and mind which responds through various signals, physical and behavioural manifestations. They are becoming input for the next interactive systems and interfaces. This vision is grounded on two main aspects: the ongoing proliferation of sensor-based technologies that can recognize the peoples’ emotional states combining biometrical signals with their behaviours; and research studies traditionally rooted in cognitive and behavioural psychology, that have established a solid scientific background around the importance of experiencing positive emotions to release stress, optimize emotional, mental and social resilience and increase health benefits and even longevity    . Aside from a technological and psychological approaches, designers are beginning to shift their attention on methods and practices to motivate a positive change. However there is a lack in practical approaches and design models for increasing wellbeing and healthier lifestyle adoption through positive emotions. 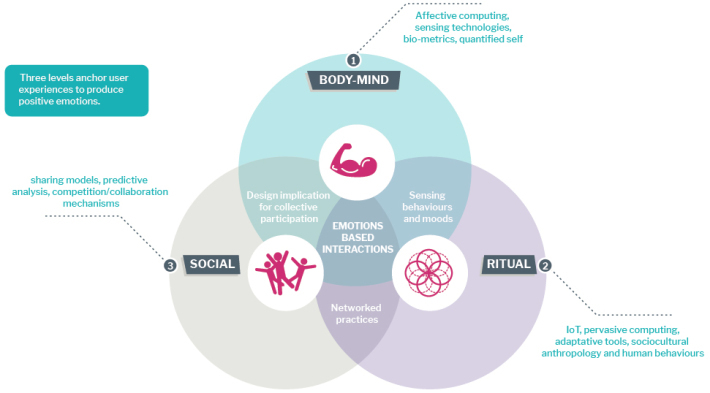 Mapping literature to this framework helped us understand the extent and the focus of emotion related HCI efforts, moving design research to extend the benefits of emotional engagement in the direction of well-being. Emotion is a subset of the irrational in the design of technologies. Every artefact conveys emotions from users since the interaction with them implies spontaneity, intuition and elicit cultural connotations. Experiencing positive emotions help to release stress, optimize emotional, mental and social resilience and increase health benefits and even longevity. The broaden-and-build theory: positive emotions – including amusement, interest, joy, contentment, pride in achievement, love, interest, satisfaction, sensory pleasure – encourage people’s exploration thought actions. Human-computer interaction is social and emotional even when interfaces are not designed with such interaction as a goal. There are two steps to increase wellbeing and our emotional life: one is to be aware of emotions, learn to read and recognise them, the second is to realize when we are responding emotionally, reactions, expressions and related circumstances, improving the consciousness between the space from the stimulus to the action. Computer Game Players find enjoyment from their internal experiences in reaction to the visceral, behavior, cognitive, and social properties. These users play for internal sensations such as Excitement or Relief from their thoughts and feelings. Engage in intentional activities that increase well-being (nurturing relations, take care of body, achieve personal goals) boost peoples’ happiness. 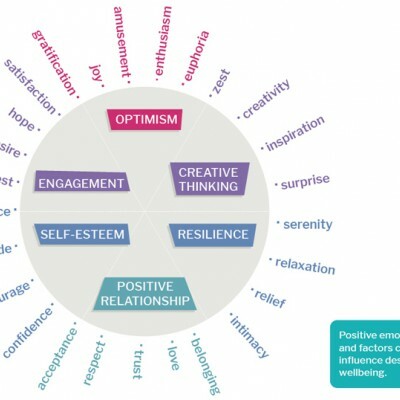 Subjective path to flourishing is a construct of five elements: positive emotions, engagement, positive relationships, meaning and belonging and accomplishment that is the sense of achievement (PERMA model). Three kinds of positive emotions: pleasure and gratification, embodiment of strengths and virtues and meaning and purpose. Enjoyment, motivation and sense of achievement are among the most desired experiences in interacting with digital games and playful artefacts. Autonomy, competence and relatedness are also innate psychological needs lead to spontaneous players’ emotional investment. As positive emotions are also physical and not only psychological they can act as a balancing fuel between body, mind and society interactions. 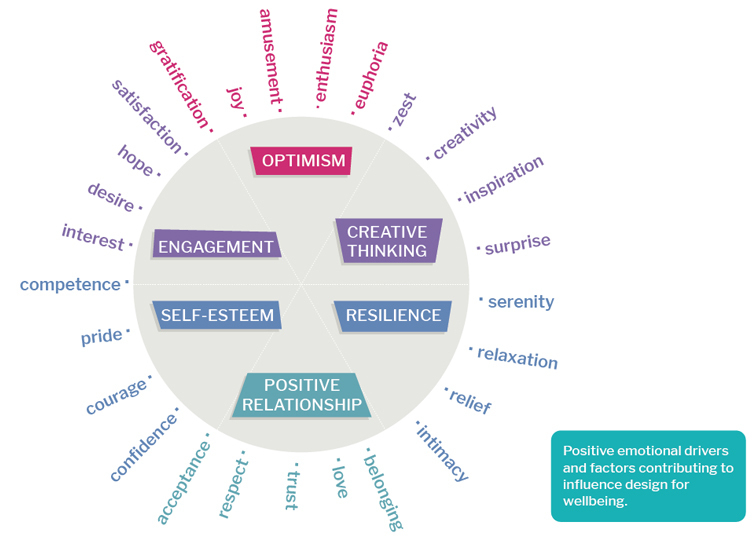 Through what challenges can design include emotions to increase the well-being level? Physical activity and exercise. One is physical and technological, it involves the tools to read, interpret and adapt to humans’ emotions. Rituals and symbolic actions. 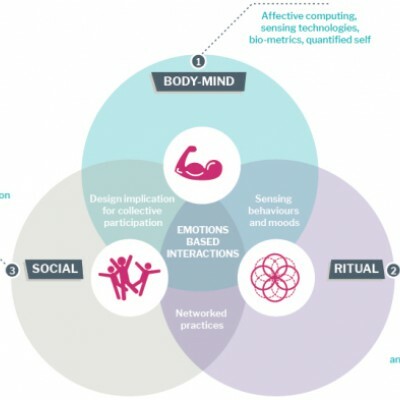 What is connected to behaviours and activities, believe system, experiences to use products and interfaces to feel comfort and increase perceived well-being. Social connectedness. The third is the social and relational level, what moves people to act, to growth and to connect each other through different languages and media. Design can provide tools and methods to facilitate this human creative way to face events. Some movements can be defined across a different disciplinary dimensions. Those provide clues into some of the factors that predicts future developments. Sensing of behaviours and moods: environmental or wearable devices, either unobtrusive, pervasive and invisible. A deeper integration of cognitive and emotional data resources into systems able to read processes and understand their circumstances. Networked practices: a broader combination of techniques and methodologies to read variance in emotions and be able to reply in a meaningful way. These allow people to elicit their emotions and to increase their self-awareness process for an emotional well-being enhancement. Collective participation: Sharing Emotions. This means considering links among biometric data, social environments and interaction behaviours. Bridging data at social level through networked media. There is a generative and contagious side of positive emotions. Users create their own personal ways to face life-challenges and stressful situations. The result presented is an insight guidance for HCI designers. Increasing the adoption of explorative, participatory tools designers can understand how to allow flexible and adaptive tools to better fulfil moods, attitudes and people creativity. Our emotions, health and wellbeing are intimately connected. Moods, attitudes and positive emotions directly influence the interaction between our bodies and the physical and social environment in which we live. The question of how to address positive experiences toward interfaces embraces a long-term vision of integrating different perspectives. We come together with Design & Emotion community to explore positive experiences and practices with the intention to facilitate them through interactive interfaces. Deterding, S. (2015) The Lens of Intrinsic Skill Atoms: A Method for Gameful Design, Human–Computer Interaction, 30(3-4), 294–335. Fogg, B. J. (2009, April). A behavior model for persuasive design. Proceedings of the 4th International Conference on Persuasive Technology (p. 40). Fredrickson, B. L. (2001) The role of positive emotions in positive psychology: the broaden-and-build theory of positive emotions. American psychologist, 56 (3), 218. Gaver, W. (1999) Irrational aspects of technology: Anecdotal evidence. In C. J. Overbeeke & P. Hekkert (Eds. ), Proceedings of the 1st International Conference on Design and Emotion (pp. 47-54). Delft: Delft University of Technology. Gaver, W. (2009) Designing for emotion (among other things). In Philosophical Transactions of the Royal Society, 364 (1535) pp. 3597-3604. Koreshoff T. L., Robertson T., Leong T. W. (2013) Internet of things: a review of literature and products, Proceedings of the 25th Australian Computer-Human Interaction Conference: Augmentation, Application, Innovation, Collaboration, November 25-29, 2013, Adelaide, Australia. McGonical, J. (2011) Reality is Broken. New York: Penguin Press. Lazzaro, N. (2009) Why we play. Affect and the fun of games – Designing Emotions for games, entertainment interfaces and interactive products, in The Human-Computer Interaction Handbook: Fundamentals, evolving technologies and Emerging Applications. 3rd ed. Ed Andrew Sears and Julie A. Jacko, 725-747. Norman, D.A. (2004) Emotional Design: Why we love (or hate) everyday things. New York, NY: Basic Books. Picard, R.W., Klein, J. (2001) Computers that Recognise and Respond to User Emotion: theoretical and Practical Implications, MIT Media Lab Tech Report No 538. Picard, R. W., Wexelblat, A., & Clifford I Nass, C. I. N. I. (2002, April) Future interfaces: social and emotional. Proceedings of CHI’02 Extended Abstracts on Human Factors in Computing Systems (pp. 698-699). Reeve, J. (2014) Understanding motivation and emotion. John Wiley & Sons. Sanders, L. (1999) Design for experiencing: New tools. In C. J. Overbeeke & P. Hekkert (Eds. ), Proceedings of the 1st International Conference on Design and Emotion (pp. 87-92) Delft: Delft University of Technology. Seligman, M. E. P. (2011) Flourish. New York, NY: Free Press. Seligman , M. E. P., Csikszentmihalyi M. (2000) Positive psychology: An introduction. American Psychologist; 55, 5-14. Zhang, P. (2008) Motivational affordances: Fundamental reasons for ICT design and use, Communications of the ACM (CACM), 51(11).